CHICAGO (WLS) -- Elvis Presley would have celebrated his 80th birthday on Thursday. The Rock 'n' Roll legend was born in Tupelo, Mississippi on Jan. 8, 1935. Celebrations commemorating "The King" are planned around the country. Graceland is live streaming an 80th birthday party Thursday starting at 9:15 a.m. CST. Priscilla Presley is scheduled to be there. Elvisthemusic.com goes live on Thursday. It's a comprehensive online database of all things Elvis. Here in Chicago, the original Mothers Bar is hosting its annual Elvis Fest Thursday night. 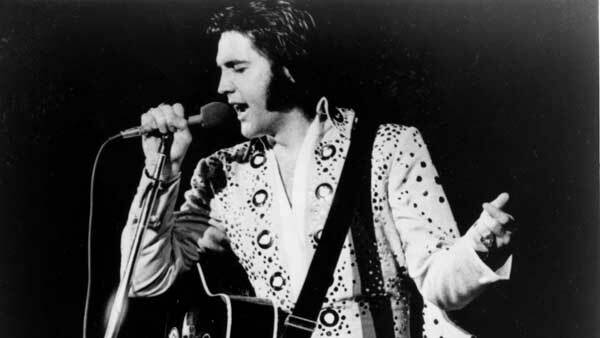 Next week, the Harold Washington Library will host its first-ever Elvis karaoke session. In 1953, Elvis Presley walked into Sun Records in Memphis and recorded the song "My Happiness." He was only 18. For $4, Presley was able to leave the studio with an acetate copy of the 78 RPM record, meant as a gift for his mother Gladys. But, as the story goes, Presley stopped by a friend's house to listen to the recording and left it there. The Presley family did not have a record player, according to Elvis Presley Enterprises, which operates Graceland. The acetate - Presley's first recording - has remained in his friend's safe for decades. And on Thursday, it will be auctioned off at Graceland - the late singer's longtime Memphis home - along with other Presley-related memorabilia on what would have been 'the King's' 80th birthday. The acetate is in original condition and the record is playable. "I'm hoping that somebody who loves Elvis Presley and is a huge Elvis Presley fan and who can appreciate the record ... ends up with it," said Lorisa Hilburn. She's the niece of the late Ed Leek, Presley's friend and caretaker of the record the singer left at Leek's house more than 60 years ago. Hilburn, who lives in Rockledge, Florida, said she inherited the record from her uncle Ed and aunt Sue after her aunt died last summer. Hilburn says her uncle kept the record, which he had authenticated, in a safe when the couple lived in Memphis and Florida. Ed Leek tried to auction off the record in the 1980s, but never actually sold it, Hilburn said. Her decision to contact Graceland and auction the record has led to a likely windfall. She notes that the starting bid for the record is $50,000. "We didn't know he still had it," Hilburn said. "It just sat in the safe. Nobody in the family ever saw the record." The record is highly valued because of its place in the career of Presley, who in 1954 recorded "That's All Right," also at Sun Records. "That's All Right" became Presley's first hit, and it catapulted him to a successful career that included hit songs such as "Hound Dog" and "Suspicious Minds," and to making popular movies such as "Jailhouse Rock." Presley's unique style, his hip-shaking dance moves, and rebellious image made him a rock and roll pioneer. He died in Memphis on Aug. 16, 1977, at age 42. Before he became the "King of Rock n' Roll," Presley was a shy young man who had moved to Memphis from Tupelo, Mississippi, with his parents. He liked to sing and one day summoned up the courage to go to Sun Records, owned and operated by Sam Phillips. Phillips was not there that day in 1953, so Presley was helped by Phillips's assistant, Marion Keisker. Presley sang the ballads "My Happiness," which was the A-side of the record, and "That's When Your Heartaches Begin," which became side B. Both are slow-moving and stop well short of suggesting a singer ready to help open the way for the emergence of rock and roll. After the record was cut, Keisker wrote Presley's name and phone number down and jotted a note that said he was a good ballad singer. The story about the "My Happiness" recording is told to visitors who take the tour of Sun Records, now a museum. Along with Presley, Phillips also recorded music legends Johnny Cash, Jerry Lee Lewis and Carl Perkins at Sun. Jayne Ellen Brooks, public relations director at Sun, says the "My Happiness" record is important because it gives fans the first glimpse of Presley's impressive talent. "This was a pop ballad song done by female singers, so as far as the song choice goes, it's really interesting," Brook said. "It sort of sums up Elvis, pre-fame."